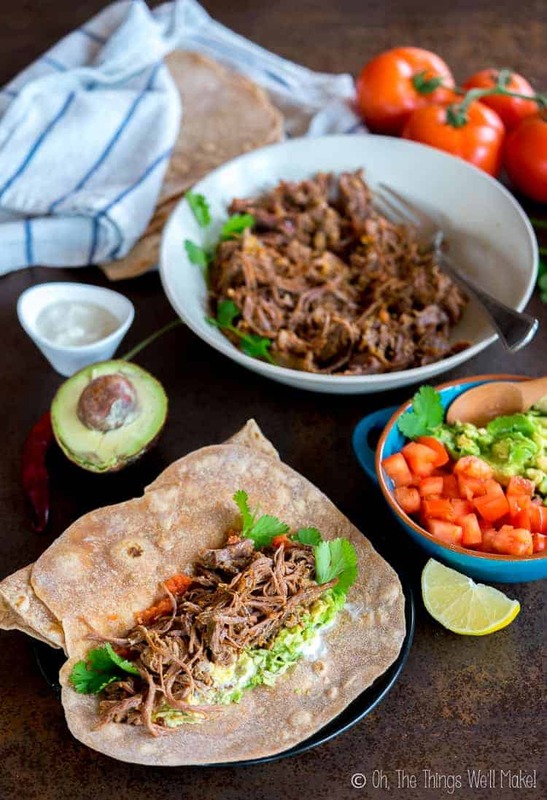 Chipotle Shredded Beef Tacos (In a Pressure Cooker) - Oh, The Things We'll Make! 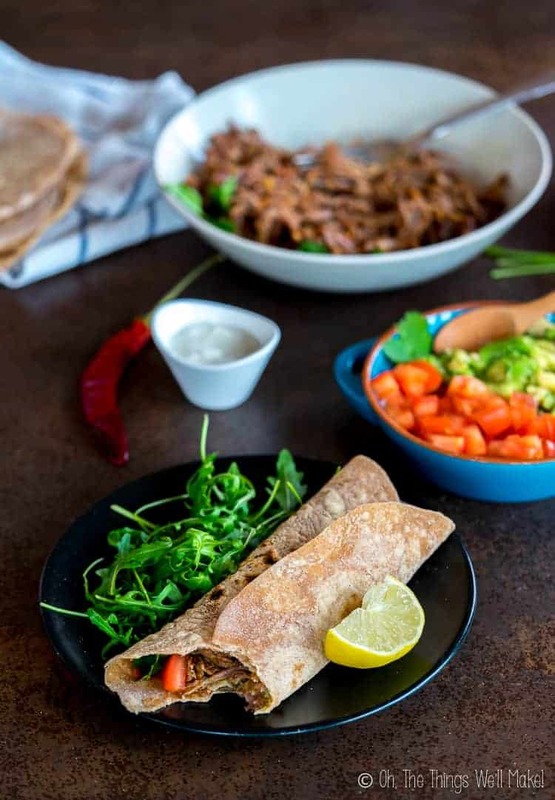 Packed with flavor, these spicy chipotle shredded beef tacos are conveniently cooked in an Instant Pot (or another pressure cooker) to reduce cooking time and result in perfectly tender shredded beef. Today, I'm excited to share with you another recipe from one of my favorite food bloggers of all time, Emily Sunwell-Vidaurri of Recipes to Nourish. She has recently published a new cookbook, Amazing Mexican Favorites with Your Instant Pot and it's absolutely gorgeous! Not too long ago, I shared with you another one of her recipes, her Citrus Herb Basque Chicken, which is also made in an Instant Pot. I had reviewed her previous cookbook, The Art of Great Cooking With Your Instant Pot, and she generously allowed me to share that recipe with you. Many of you tried it and commented on how delicious it was. I have to agree. Since posting that recipe, I have made that recipe and adaptations of it many a time at home. Both my husband and son really loved it. This cookbook is special because it was co-authored with Emily's husband, Rudy, who has Mexican heritage and former chef experience. She brings to the cookbook her insight as a busy mother, and the two of them, together, come up with exceptional recipes that aren't too complicated to make at home. What can you find in the cookbook? The cookbook features 80 delicious and authentic tacos, burritos, fajitas, and other flavor-packed recipes. What makes this cookbook special, though, is that ALL of the recipes are made with REAL, wholefood, naturally gluten-free and soy-free ingredients! There are a lot of Instant Pot recipes and cookbooks floating around by now, but many of them are filled with recipes with lots of sugar, wheat, and processed ingredients. Here, though, you won't be using boxes and cans, but will be serving up delicious meals from scratch! 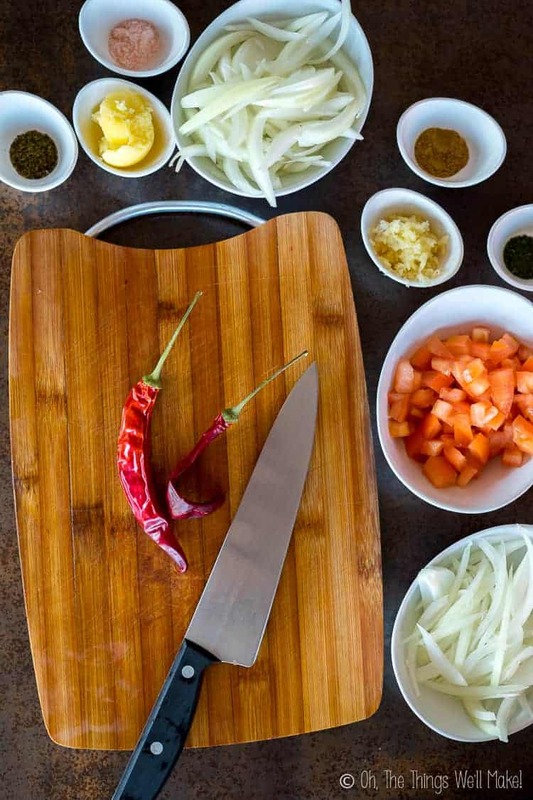 While you will find some rice and beans in the recipes, many of the recipes are still paleo friendly or easily adaptable to those that are following a Paleo lifestyle. What sorts of recipes will you find? What did I think about the cookbook? If you love Mexican food and have an Instant Pot or another pressure cooker, buying this book in a no-brainer. I highly doubt you'll be disappointed unless you are wanting a book that throws together a can of this and a box of that. If you want real food from scratch, though, this is your book! Don't have an Instant Pot? No problem! Neither do I! I have another similar type of electric pressure cooker that also has a stainless steel insert. (I avoid pressure cookers with non-stick coatings to their insert.) I had absolutely no problem adapting the recipes to my pressure cooker! When deciding on a recipe to review, I opted for the shredded beef tacos because it's a recipe that really appeals to me, and yet it's one that I've never actually tried to make before. I make homemade carnitas quite often, especially when I know I won't be able to be around at the time I normally make dinner, because it's easy to throw a pork shoulder into my slow cooker and let it do its thing. I was really curious about making a beef chuck roast, tender enough to shred, in an Instant Pot. It's just not something I had tried yet. I was also worried about it coming out bland. After seeing the interesting combo of chorizo and beef, though, I was intrigued. I figured this was going to be another winning, flavorful recipe from Emily and her husband. And I was right! One of Rudy’s favorite things to do is pair meat with even more meat, so this one is dedicated to our meat-loving readers. Are these beef tacos too spicy? I have to admit that I was skeptical of her last recipe with its unusual combination of ingredients (dried tomatoes, chorizo, orange juice, and green olives?!?!?) but when we tried it, we were hooked! The basque chicken was very flavorful and all of the flavors combined to perfection. So, I guess I should have been more trusting when it came to this one! I am a forever skeptic and experimenter, though, and I was worried about it being too spicy. So, not only did I take their recommendation of removing the seeds from the peppers for those who want milder tacos, but I also reduced the number of chiles used. In the end, they turned out quite mild, and I was regretting not having followed the recipe exactly! Luckily they were delicious anyway. I'll definitely be making these again, and will follow the recipe exactly as written. I'm guessing that the recipe is perfect as is. My thought is that it will give you just the right amount of heat if you use the peppers without the seeds. On the other hand, those that want a spicier dish should leave them in. Which tortillas should you use? 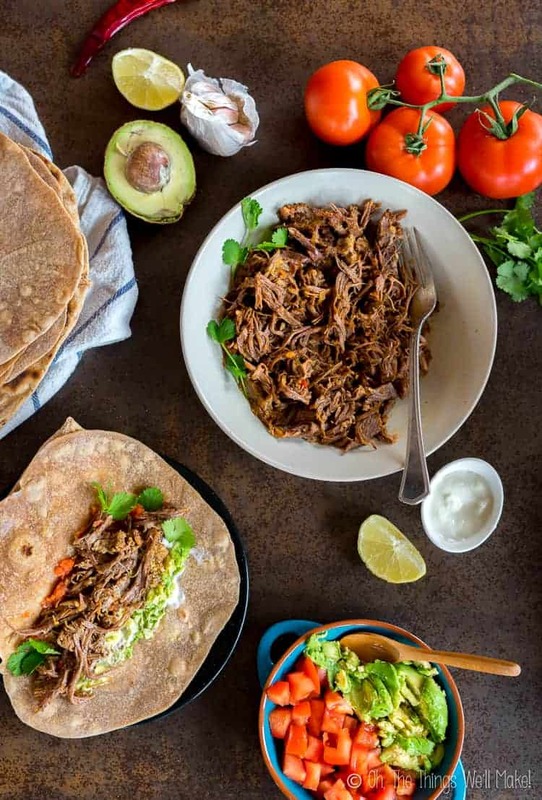 I would say that you could use any tortillas that you normally like to use for these shredded beef tacos. If you're short on time, go out and buy whatever tortillas you prefer. On the other hand, with a bit of extra time, you can make this meal even better! My son wanted flour tortillas, and I didn't have any at home, so I made some from scratch. I used to make homemade flour tortillas all of the time but stopped making them when I started to follow a more paleo-type diet. For a while I been buying the flour ones for my son and husband and making my own flaxseed tortillas instead. I have to admit to loving flour tortillas, though. Perhaps, I'll share my recipe for homemade flour tortillas someday soon. They're very easy to make and taste a lot better than the ones that you buy. After years of experimentation, I've decided that I'm a lot more negatively affected by dairy products than gluten. So, while I don't eat a lot of wheat, I do occasionally incorporate it into my diet again these days. 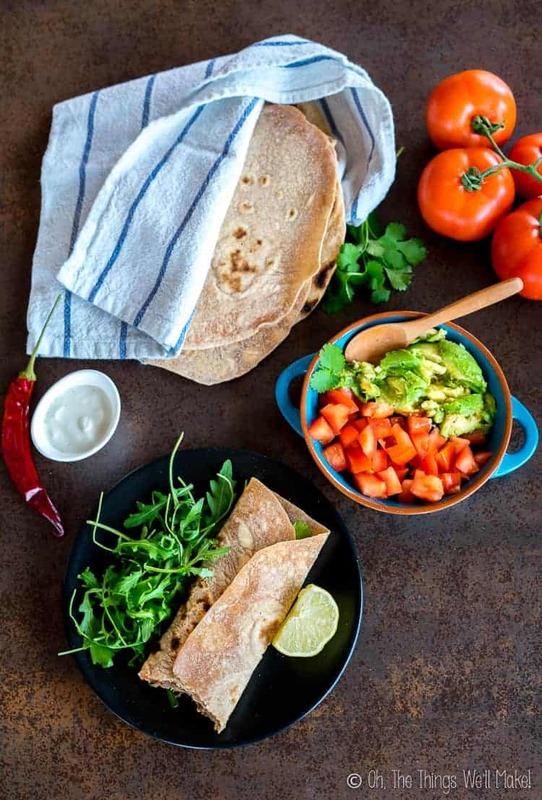 If you want a similar tortilla, though, but without the wheat, you could try using cassava flour or could make my tapioca flour based paleo pita wraps. If you prefer corn tortillas, I showed you how to make your own corn tortillas from scratch in my homemade carnitas post. I may update that post soon and separate the corn tortilla recipe to show you more in depth the best way to make them. In the case of corn tortillas, the difference between the store-bought ones and the homemade ones is even greater! Store bought corn tortillas remind me of rubbery cardboard. For those of you looking for a corn free, gluten free option, I have several flax-based tortilla recipes up on the blog. I make these quite often and they are actually quite simple to make. The easiest ones are probably the egg and flaxseed tortillas. I make them the most often because I usually have a lot of fresh eggs on hand from our hens. For those avoiding eggs, though, I have a really tasty pliable tortilla that uses only flaxseeds and water! Seriously! As a tortilla, they taste a lot like corn tortillas, and you can crisp them up in the oven to make taco shells and tortilla chips! While any of the above tortillas can probably be hardened over the grill of the oven, my flaxseed taco shell recipe would be perfect here! Our rating for the recipe? Everybody in the family happily ate these tacos, and we, again, give it three thumbs up. Because my husband, son, and I all loved them, it will be easy to make these again without complaints from anybody- those are the sorts of recipes that I love! 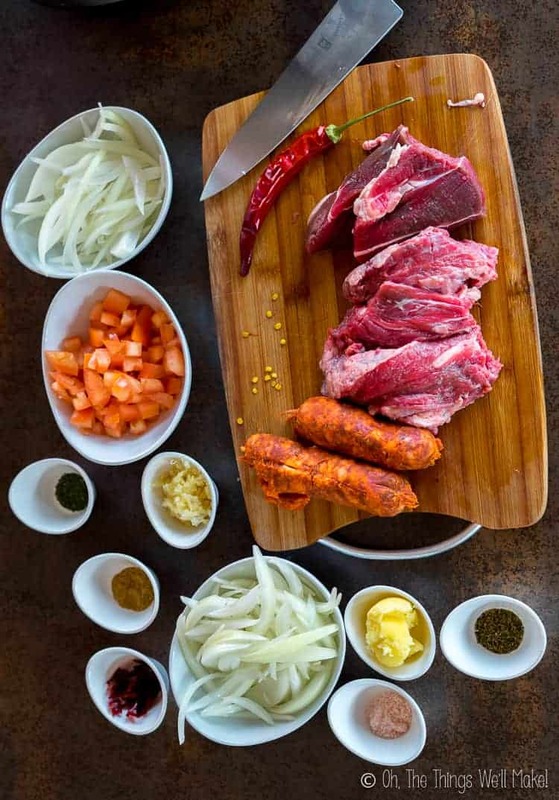 Native to Puebla, Mexico, this dish combines generous bites of beef with the saltiness of Mexican chorizo in a smoky chipotle sauce. warmed tortillas gluten-free corn, grain-free, etc. When the fat has melted, add two pieces of the chuck roast, season with ½ teaspoon of the salt and brown on each side, about 3 minutes per side. Remove the browned meat to a plate and set aside. Add the remaining two pieces of chuck roast, season with ½ teaspoon of the salt and brown on each side, about 3 minutes per side. Remove the browned meat and add to the plate with the other browned meat. Add the chorizo and onion to the Instant Pot, sautéing for 3 minutes, stirring occasionally, then add the garlic and continue to sauté for 1 minute, stirring occasionally. Press the “Keep Warm/Cancel” button. Transfer the chuck roast chunks to a large plate and shred the meat using the tines of two forks. 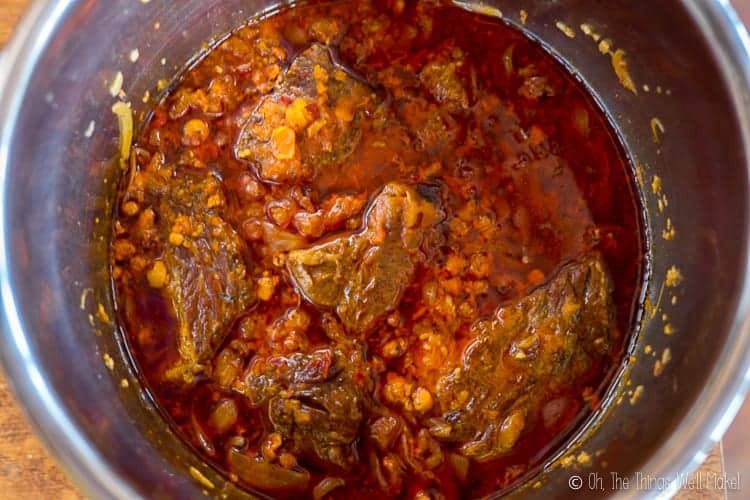 Return the shredded meat to the Instant Pot, and stir to coat the meat in the sauce. Serve immediately in your favorite taco tortillas, or serve the meat in burritos, on top of nachos, on top of rice, in burrito bowls, etc. Garnish with the toppings of your choice. 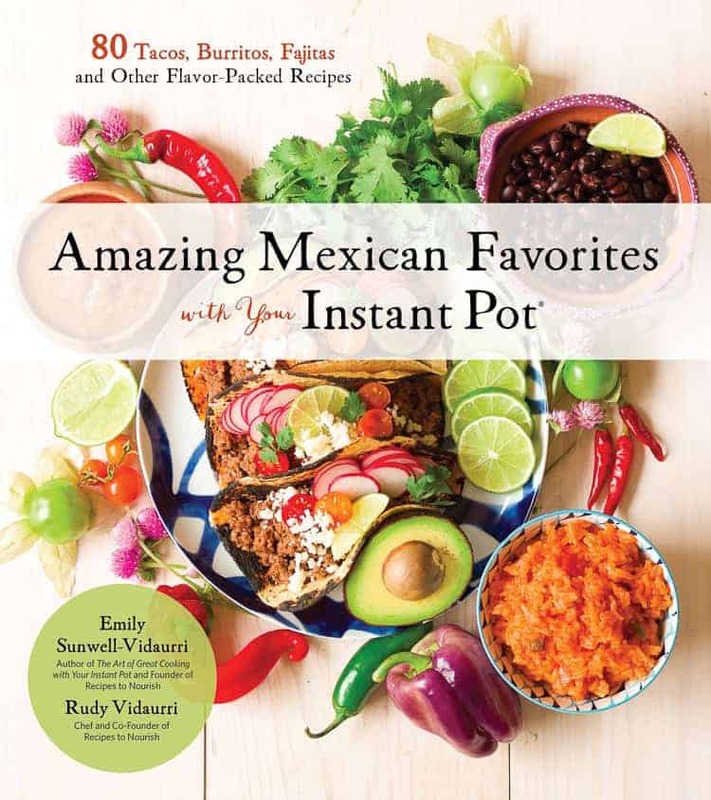 Reprinted with permission from Amazing Mexican Favorites with Your Instant Pot by Emily Sunwell-Vidaurri and Rudy Vidaurri, Page Street Publishing Co. 2019.